to make and share notes ever. This is the most user-friendly, cross-platform online notepad, ever. With these awesome features, you'll fall in love with NotePad. Create, store, edit, share, delete, add images, and search for unlimited rich notes. Indefinitely. 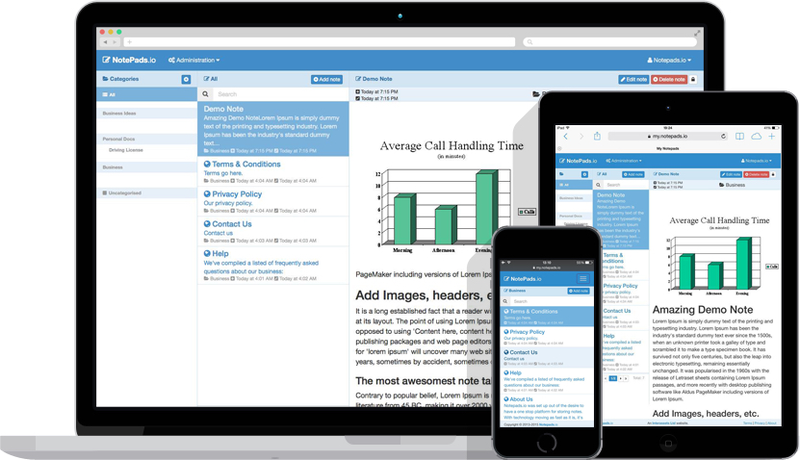 Organize and manage your notes with drag-and-drop categories and sub-catagories. Super easy note management. You can access your NotePad anytime, anywhere on any internet enabled device. Smartphones, tablets & laptops. NotePad is permanently in my favourites tab. It's one of the only note taking apps that will literally be anywhere I go. It's perfect for keeping important information at hand. I love NotePad! As a writer I needed a notepad that joins me on the adventure of life. It's an invaluable tool for anyone looking to turn thoughts into memories. Help Us Keep NotePad Awesome. No contract. No risk. 14 Day Trial or Money Back Guarantee. Do I need to use my credit card to start? Nope. Our Personal account is 100% free and does not require credit card information to start. It comes fully loaded with all the features that our professional versions have, but is supported by adverts to keep it free. Absolutely. You can switch between our paid plans, or cancel your subscription altogether, whenever you like. We will adjust any payments accordingly. No. Sign up for a free full featured, unlimited version of NotePad completely free (supported by ads). Once you're ready to upgrade, you may choose a plan which suits your needs. We accept payments from MasterCard, Visa, Visa Debit and American Express. Remember, you do not need to supply card details to create your free account.